FACT CHECK: Is This a Group of Deported United States Military Veterans? Does This Photograph Show a Group of Deported U.S. Veterans? A picture of veterans in Mexico who were deported after serving the U.S. military was met with some skepticism. A photograph shows a group of deported U.S. veterans in the Mexican border city of Ciudad Juárez. 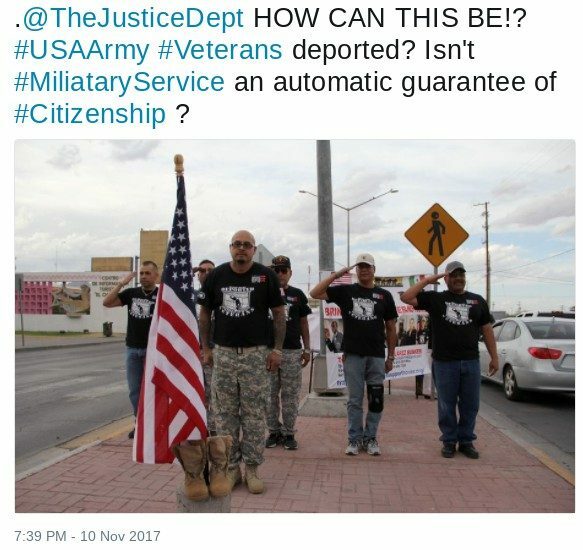 In November 2017, during Veteran’s Day weekend, a photograph showing a group of former U.S. military members who had been deported from the United States went viral. Some viewers regarded the image with equal parts skepticism and dismay: Was the United States really deporting veterans? Getty Images used a similar caption for this photograph and added that the men pictured were veterans of the Vietnam and Iraq wars. Sgt. Ivan Ocon, who is standing at the front in this photograph, was born in Juarez but came to live in New Mexico as a child. He served in the U.S. Army from 1997 to 2004 and was deployed with Operation Iraqi Freedom in 2003. He was deported in 2016 and now heads the Deported Veterans Support House in Juárez. Our intention was to pay honors to our fallen comrades, and give honor to all the fallen soldiers, brothers in arms. We’re still veterans, and we would celebrate that holiday in the United States, but because we are here we just celebrated in our own way, you know? The irony is, the American Flag is right over the bridge — but we can’t go there. 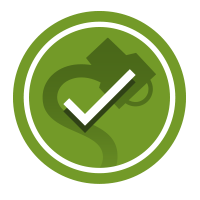 Serving in the United States military does fast-track citizenship applications under some circumstances, but it is not an automatic guarantee of such, which many non-citizen military members do not realize until it is too late for them to take advantage of the program. Since 1996, the United States Government has been deporting veterans who, as legal permanent residents, joined the United States Armed Forces and served their country proudly. Veterans who have been deported served in wars such as Vietnam, Persian Gulf, Kosovo, Iraq & Afghanistan, and served in both combat and peacetime. The deported veterans support house has come into contact with over 100 veterans who have been deported or being deported to over 30 countries of origin around the world. All of these veterans had legal residency status, Veterans Administration (VA) Benefits as well as strong ties to the United States prior to deportation. All of the veterans whom we have met maintain a strong desire to return to the United States, as many have hardly known any other home throughout their lives and have been forced to leave behind children, spouses, parents, and siblings as well as firmly established lives and communities in the United States. Several other Deported Veterans Support Houses have been established, from across the northern Mexico border to Haiti and Jamaica. TaskandPurpose.com, a military web site, published an article about the issue in 2015, and other news outlets such as CNN, the Los Angeles Times, NPR, and Fox News, have been covering the issue for years. We have also received queries about whether it is true in general that the United States is deporting veterans of its military forces. The answer, as you might have guessed, is yes, it is. Task and Purpose. 17 December 2015. Los Angeles Times. 27 March 2016. Fox News. 13 April 2016.